The following information has been adapted from the Crucible Materials Corporation Web site and Data Sheets for CPM S30V. 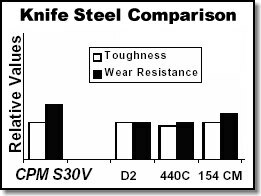 It provides some technical comparisons to other common high-end knife steels and can explain, to a degree, why CPM S30V excels. CPM S30V is a martensitic stainless steel designed to offer the best combination of toughness, wear resistance and corrosion resistance. Its chemistry has been specially balanced to promote the formation of vanadium carbides which are harder and more effective than chromium carbides in providing wear resistance. CPM S30V offers substantial improvement in toughness over other high hardness steels such as 440C and D2, and its corrosion resistance is equal to or better than 440C in various environments. The process of producing CPM (Crucible Particle Metallurgy) steels involves gas atomization of pre-alloyed molten steel to form powder. This powder is then screened and then isostatically compressed into 100% dense compacts. The CPM process produces steels withe no alloy segregation and extremely uniform carbide distribution characterized by superior dimensional stability, grindability, and toughness compared to steels produced by conventional processes. 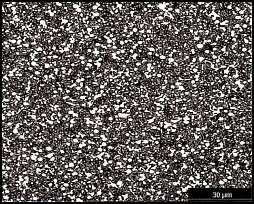 CPM S30V is made by the proprietary CPM process, which results in a homogeneous, finegrained microstructure with uniformly dispersed carbides, as can be seen in the magnified photo above. The composition of S30V is balanced to promote the formation of vanadium-rich (MC type) carbides which provide better wear resistance than chromium-rich (M7C3 type) carbides. Conventional AISI 440C is a martensitic stainless steel containing chromium (M7C3 type) carbides for wear resistance. 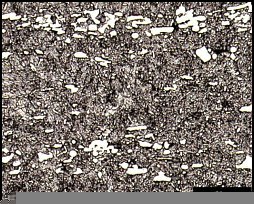 This typical 440C sheet microstructure reveals carbide banding which reduces toughness and, depending on the severity and location, can cause chipping at a very fine edge. CPM S30V 10.0 ft. lbs. Although the longitudinal toughness for all three of these grades is about 25-28 ft. lbs., the transverse toughness of CPM S30V is four times greater than that of 440C or 154CM. These higher transverse toughness results indicate that CPM S30V is much more resistant to chipping and breaking in applications which may encounter side loading. In knifemaking, its higher transverse toughness makes CPM S30V especially good for bigger blades. The CATRA (Cutlery & Allied Trades Research Association) test machine performs a standard cutting operation and measures the number of silica impregnated cards which are cut (TCC = total cards cut). It is considered a measure of relative wear resistance. Note: Properties shown are typical values. 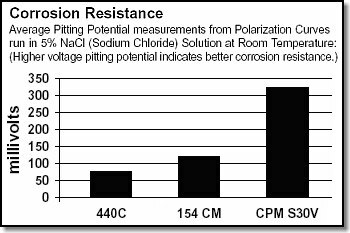 Normal variations in chemistry, size and heat treat conditions may cause deviations from these values.